NY: Simon & Schuster, 1966. Housed in a VG+ dustwrapper that some darkness to extremes of book (from a previous dustwrapper protector). Inscribed and signed to Jerry Mayro, a NYC bookseller. A tight clean copy of a rather hard-to-find book by Ms. Ross.. Signed by Author. First Edition. Hard Cover. VG+/VG+. NY: Random House, 1943. Blue cloth shows a bit of spotting. The dustwrapper is red, white and blue and is clean and bright.. This "Army Air Forces Play" is boldly Inscribed and Signed to Charles Carroll of New Hope, PA. on the ffep. Prev. owner's (Mr. Carroll's) neat bookplate. 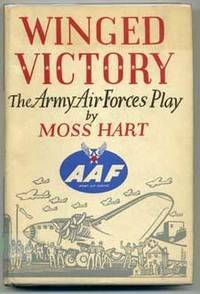 Overall a very nice first edition with a handsome Moss Hart inscription.. Inscribed and Signed By Artist. First Edition. Hard Cover. VG+/VG++. NY: Museum of Modern Art, 1954. The first edition of this pamphlet of Linoleum Block Prints by Frasconi, narrated by Wescott. Inscribed and Signed on the first page by the author (handsome signature). A tight, clean copy and rather scarce signed. Inscribed to the NYC Literary Agent, Henry Volkening and his wife.. Inscribed and Signed By Author. First Edition. Printed Wraps. Near Fine/No Jacket. Illus. by Antonio Frasconi. 8vo - over 7¾" - 9¾" tall.